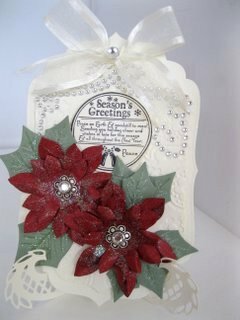 Christmas is coming and the Spellbinders Poinsettia Flower Card is perfect for that time of year. The flowers can be as plain or as fancy as you want ... it is only your imagination that will stop you. 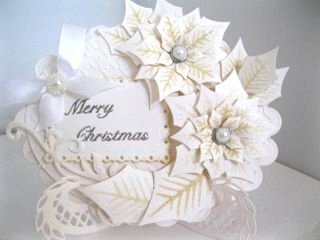 They can be made from card which will give them some substance, or use some pretty papers that you have in your "Stash"
Another point worth remembering is that the flowers don't just grow in red ... Oh No! 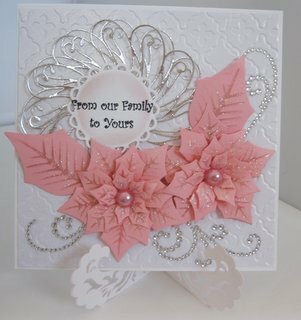 There are also pink ones and a lovely cream one that can grace the front of your designs too. 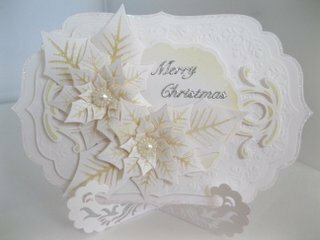 Add in some glitter and make use of the jewelery spacers that can be placed underneath the Brads that you may choose to use to hold the petals together. Or just add in a pearl centre to make the flower look special. 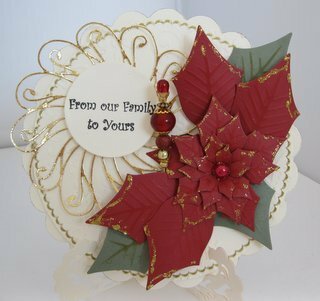 Here are some ideas for Red Poinsettia Flowers ... and the video will show you how to create them for your self. On the one on the left I have added in a Decorative Hatpin whcih will double up as small gift for the recipient. 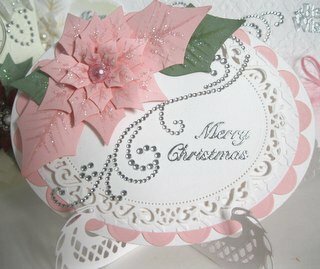 And the pink ones are some of my favorites, making for a very modern look to your cards for this season. Why stick to traditional red and green ... ring the changes with the pastel colours and dare to be different. And another all time favorite with lots of people are the cream ones. Try adding your flowers in groups as well as in singles, and I always like to cut extra of the larger leaves to add under the main flower shape for fullness. 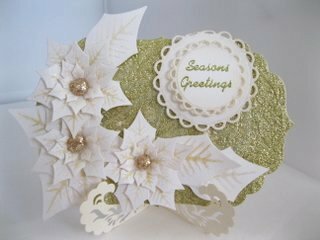 So there you have a few ideas on how to make your very own Spellbinders Poinsettia Flower Card... and send them out with love this year.